Ruisrock is one of the most traditional rock festivals in Finland it's been there every summer for over 30 years [Kimmo: in fact it's the second oldest ongoing rock festival in the world!]. Last year the festival was not a success and they suffered big losses. This year they had fresh blood organising the festival and with a help of excellent weather the festival was sold out both days. Me, Satu and Kimmo were naturally there because the line-up was very interesting. To our disappointment the arrangements sucked big time, both with media and public. The information that the media was given changed constantly and things that had been agreed beforehand proved to be totally different when arriving to the festival area. Sure, there was a lot to complain about but I'm not gonna waste your time with any more whining. The most important thing is to bring you a report of the festival with a few interviews and I'm happy that we're able to do just that. Ruisrock took place in a beautiful surrounding by the sea in Ruissalo. There were actually big cruisers passing by just a hundred meters from the shore which got some of the bands really amazed. No wonder, it's not that often that a 150 meter cruiser passes the stage from only some 200 metres away. There were two stages that were located almost opposite of each other. So when one band was playing on one stage the other was set for the next band. 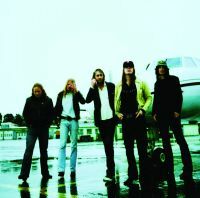 The line-up this year consisted mainly of Finnish bands with only two foreign bands, the Swedish rockers Hellacopters and Backyard Babies. 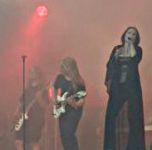 The most well known Finnish international artists were also there as HIM, The Rasmus, Stratovarius, Nightwish and Bomfunk MC's were among the most expected artists. But the biggest highlight of the weekend for many was on Sunday when the former members of Hanoi Rocks, Michael Monroe and Andy McCoy, hit the stage after some fifteen years of being apart. 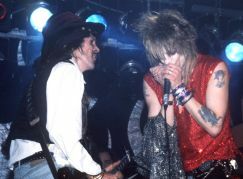 They didn't want to call it a reunion of Hanoi Rocks because the band is no more, so the gig was titled "Hanoi Revisited". But still a chance to see the old classics live after many years. And now that the two have started to work together again we can expect some new music as they have already written some new songs. For more info, check out the report from their press conference. So, there was a lot to look forward for the weekend. The Rasmus was the first performer on Saturday. Unfortunately we can't comment on their show because we were still on the way to Ruisrock as they played [Kimmo: what I heard while I was walking down to the area and getting my ticket etc, sounded very good...]. But for consolation we have an interview with the bands lead singer Lauri. After The Rasmus a few Finnish-singing bands took the stages, the most notable being Tehosekoitin, a punkish rock band soon to release material in english too, who were rather energetic, and Timo Rautiainen and Trio Niskalaukaus, a very heavy band with three guitarists...[Kimmo: I could swear that one of the songs of Trio Niskalaukaus had borrowed its' riff from Motley Crüe's "Looks That Kill"!]. 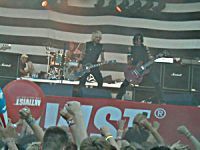 The next band of more interest was the Backyard Babies, pictured above. The band has said that their last album (Making Enemies is Good) is so excellent that it's gonna be a classic, so it was time to see how the songs worked live. And there's really no need to complain. Their performance rocked and as the gig progressed they warmed up the crowd well. They do have a lot of good songs which work live pretty well but not quite enough for the whole gig. Still a lot of show rock attitude and style thus their performance was enjoyable to watch. They opened with "Brand New Hate" which was followed by "Made Me Madman" so the start in my view was excellent. They didn't want to slow down at all and it was rock 'n' roll loud and hard from the beginning to the end. Much to disappointment of many they didn't play "Painkiller", a midtempo song from their new album but I'm quite sure that most of the people were still satisfied. But most of the people were still waiting for the last big number, HIM, who's music is often categorised as "Love Metal" (Take note, Ted Poley & Melodica!). Categorise it as you wish, here's what Satu had to say about their gig. HIM gathered a lot of crowd as was expected. This was the only gig in Finland this summer and I heard there were people coming from all over the world. Which I noticed while waiting for the band to come on stage. I spotted Japanese, Germans, etc. Ruisrock was sold out both days and it wasn't that fun to be squeezed in between all those people. I didn't get to see the band as well as I wanted to [Kimmo: and there was no chance for me to push thru the crowd to get some photos! ], but enough to tell you the bassists stage appearance has gotten a bit lame since the club days. He still has some weird moves though, you wouldn't want to miss out on those! 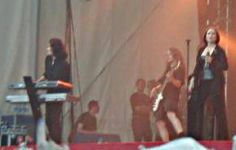 Also Ville Valo, pictured left, seemed like really bored, maybe he's been doing too much work these days? Or is he going back to that relaxed guy who used to drink wine on stage (without the wine though) ? What about the jacket that said " Your pretty face is going to hell", self irony or what, but it doesn't drive away all those girls swarming around him. They started the set with a new song "Please don't let it go", which the crowd seemed to love. In my opinion it wasn't as good as what I've gotten used to hearing from HIM. Then followed by songs like "Poison girl", "Right here in my arms", "Your sweet six six six", "Gone with the sin", "Wicked game", another new song "Pretending", etc. Crowd seemed to love every song. If you didn't have a chance to see the band on stage, you could spot them from this huge screen what should be a must on all bigger festivals. I got a few laughs when I noticed the funny pictures in the drumkit; french fries, lemonade and a hamburger...and talk about three bassdrums, now that's something ! The last song "Join me" made the crowd go wild. Who knows how wild it was in the first row, but I saw two girls being carried away because of leg injuries. So the beach was really packed and a lot of excitement going on. Why not, HIM are good at what they do ! And the fireworks (arranged by HIM) were great afterwards, though I almost lost my hearing...we also got an interview from Ville Valo, check it out! Day two had basically three names to wait for that would ring any bells anywhere else than in Finland: Hanoi Revisited, The Hellacopters and Bomfunk MC's. Many dreams were about to come true as the generation that had loved Hanoi Rocks music for a long time but was never given a chance to hear their music live were about to experience just that. So the mood was what you would expect, impatient and nostalgic waiting as the big moment was coming closer. Finally the stage was filled with smoke. The crowd gets wild and expects the music to start any second. But not just yet. The smoke clears and no one is there. Again, a lot of smoke. Maybe now? Still no. Some whistling and booing by the crowd, and it gets louder when the stage is filled with smoke a few more times and still nothing happens. Then finally someone is on the stage. The presenters are there to do their normal "are you ready to rock" things but everyone is just waiting for them to get off the stage because the gig had been delayed already for quite a while. Then finally the music starts. The years of waiting are over. It's not Hanoi Rocks but close enough. The band sounds tight, Michael Monroe is full of energy and sings really well, the drums, the bass… but what the heck is wrong with the guitar? The answer is quite obvious. I know that Andy McCoy has had his problems with substances but Andy please! The man could hardly stay on his feet. OK, I've seen him play flawlessly in such a state before but this time his condition really affected his playing. Some solos, what can I say… it's better I say nothing. Monroe and McCoy stated in their press info before the gig that they will have some different versions of some songs but I'm sure this is not what they meant. Still the band rolled quite well with one wheel missing and soon I decided to enjoy the gig anyway and be happy just to be there. "Underwater World", "I Can't Get It", "Don't You Ever Leave Me", "Cafe Avenue"…The gig could've been perfect but it never really quite got there. On the other hand most of the crowd seemed to forgive Andy because when the last tunes of "Million Miles Away" were played the cheering was endless. I think the next generation have taken these two in their hearts and they are finally respected for what they really are: extremely talented musicians, gifted songwriters and most of the time excellent live performers. They are writing new material at the moment so let's just hope the magic is still there. After Hanoi Revisited I moved on to watch The Hellacopters, pictured left. Andy and Mike had extended their time so as I was walking to the other stage I could already hear "Toys and Flavors" which was too bad because I really like that song. At the time I got to the stage I immediately started to look to the direction of sound board. Either the man was deaf or there was no one there. Knowing what the Hellacopters are capable of it was really annoying that the sound was so horrible. The set hadn't changed too much from that of four months ago when I last saw them. The performance was as good as it could get with those sounds. It was really frustrating that most of the joy of seeing them live was lost because all you could hear was just a blur. After the gig I decided to go home. There was still Bomfunk MC's (an interview I did already get from their bassist Ville...) to see but it was better to leave early. The day before, after the last performer the traffic had been just terrible and I wanted to avoid that. And the bands that I really wanted to see had already played anyway so there was nothing left to do than to sum it all up. Two days of sunshine, good bands, bad organising and some really interesting people. Not the worst way to spend a weekend. Petri Kautto, , with additional commentary from Satu Reunanen and Kimmo Toivonen, .